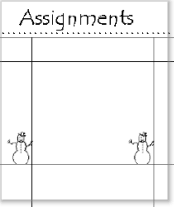 I started out using a 5x7 grid for my homeschool lesson plans. 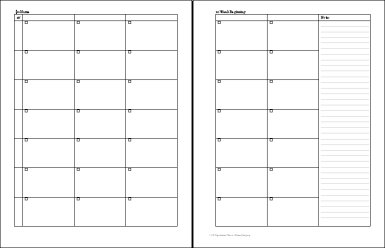 Mine was a 2-page planner and there is one on this page that is similar to it here: 5x7 2-Page Lesson Planner. I did not seem to have many 5x7 grids, so I made a few. Except for the Weekly Log, all of the files on this page are new as of today, November 8, 2010. Tip: If you are new to making lesson plans, please visit this page: Homeschool Planning Help to learn how to make very simple plans from different types of books. Weekly Log The header reads: Weekly Log. 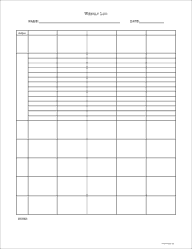 This form has the standard 5 columns and 7 rows. One of the rows is extended and ruled. That larger ruled row could be used for Language arts. 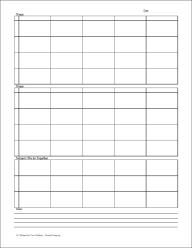 Weekly Log Type-able PDF: This form is very similar to the one above except it is type-able. Caution: Adobe Reader will not save what you type. This form must be filled out and then printed. 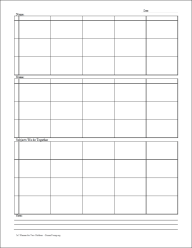 Related: This planner form is included in Portfolio X - If you decide to use this planner, be sure to look at Portfolio X before printing the planner from this page. The ruled Edwardian weekly planner has 5 columns 7 rows and check-off bubbles. The blocks are approximately 1 1/8 " tall x 1 1/4 " wide. 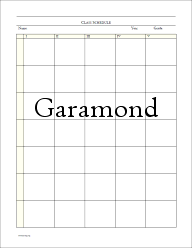 This planner is from the Garamond Planner set; it's a large set, worth a visit, go there to complete your homeschool planner. 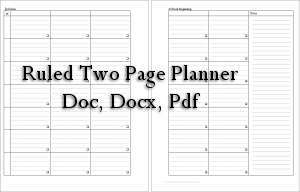 The High School Planner is also part of the Garamond Planner files. Blocks measure a bit over 1 1/8 " tall 1 1/4" wide. This file somehow never made the cut until today - Nov. 8, 2010. It is designed after the Snowman Planner. In Spring Thaw, the snowman is melting. 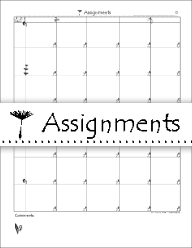 This planner file is similar to the one I used when I first started homeschooling. I divided the blocks to use with my two children. I have made both a ruled and an unruled version of the file. This planner requires two sheets of paper to print. One side has 3 columns for Monday, Tuesday and Wednesday and 7 rows. The second page has 2 columns for Thursday and Friday, one columns for lists, and 7 rows. The lesson plan blocks are approximately 1 1/4 " tall x just over 2 1/8 " wide. *The ruled area in the list column is made from an image. If you use the word format of this file, you will need to remove the image in order to type in that column. **Ruled Doc and Docx - The ruled lines that are inside of each planner block is an small table. Blocks - just over 5/8 " tall x a little over 1 3/8 " wide. The 2-children planners have 3 sections. The two top sections can be used for subjects that the two children do individually and the bottom section can be used for the subjects that the children do together. Blocks -3/4 " tall x a little over 1 3/8 " wide. 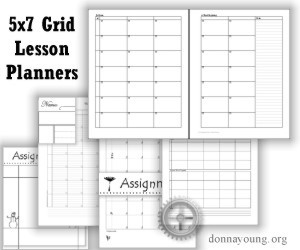 "Printable 5x7 Grid Lesson Planners at Donna Young.org"